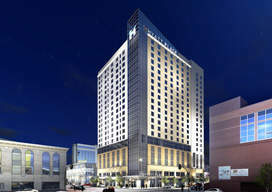 DENVER, CO--(Marketwired - Oct 16, 2013) - White Lodging, one of the hospitality industry's leading ownership, development, and management companies, has selected the joint venture of general contracting firms Swinerton Builders and Shiel Sexton to construct the new 21-story, dual-branded Hyatt hotel at 14th Street and Glenarm Place in downtown Denver. Construction of the 361-room property is scheduled to start in early November, with an opening set for late summer 2015. At the peak of construction activities, the project will require up to 400 construction workers, according to Jared Hoeflich, Swinerton project executive. The joint venture will be actively pursuing pricing and making commitments to the subcontracting community over the next few weeks. The 306,000-square-foot building will feature both Hyatt Place, a select-service hotel, and Hyatt House, an extended-stay product. Each hotel will have its own entrance, lobby, restaurant, and lounge area, though hotel guests will share conference rooms, a swimming pool and work-out area, and four levels of underground parking. The new hotel will be near the Colorado Convention Center, the Theater District, and the Swinerton-built Four Seasons Hotel, which opened in 2010. "The location on 14th Street and the amenities of this dual-branded new hotel offer an attractive option for business travelers, convention attendees, and visitors to Denver," said Scott Conrad, Swinerton vice president and division manager. "Swinerton is excited to once again build in the Theatre/Convention Center District in downtown and leverage our expertise honed on constructing the nearby Four Seasons Hotel on this new project for White Lodging." According to the Downtown Denver Partnership's 2013 "State of Downtown Denver" report, both hotel occupancy levels and average room rates have risen 73.4% and to $153.50, respectively. "As this area continues to evolve, we look forward to completing this project, which will contribute to Denver's economy, restaurants, retailers, and local businesses," said Kevin Hunt of Shiel Sexton, an Indianapolis-based general contractor who has completed five hotels, with two additional hotels completing in 2014, for White Lodging. "It will fit in very nicely with the Colorado Convention Center and the recent pedestrian improvements made to the 14th Street corridor." About Swinerton: Swinerton provides commercial construction and construction management services throughout the United States and is a 100% employee-owned company. Swinerton, recognized as a Denver Post Top Workplace company by WorkplaceDynamics in 2013, has been building Colorado since 1942 and is devoted to the region with a passion for delivering the highest quality product through innovation, integrity, and experience. For more information on Swinerton, visit the company's blog at SwinertonBuildsTomorrow, Facebook, Twitter, Flickr and LinkedIn. About Shiel Sexton: Shiel Sexton is a construction and professional services company with over 50 years of experience in providing the highest quality general contracting and construction management services available. Shiel Sexton is consistently ranked among the nation's Top 400 construction firms according to Engineering News-Record. Through many years and numerous projects, their core principles of integrity, enjoyment, expertise, and relationships have kept them strong, no matter where they're working. For more information on Shiel Sexton, visit their website at www.shielsexton.com or find them on Facebook, Twitter and LinkedIn. About White Lodging: White Lodging Services Corporation was established in 1985 and is headquartered in Merrillville, Indiana. White Lodging is a fully integrated hotel ownership, development, and operations company focused on developing and operating premium-branded hotels in growing urban markets across the United States. The company is a recognized leader that has defined and cultivated the ability to achieve consistent, sustainable growth among mid- to large-scale hotels. Its current portfolio consists of more than 168 hotels in 21 states and encompasses representation of the following leading brands: Marriott International, Inc., Hilton Worldwide, Hyatt Global, Starwood Hotels and Resorts, Preferred Hotel Group, and InterContinental Hotel Group. For more information about White Lodging, please visit www.whitelodging.com.